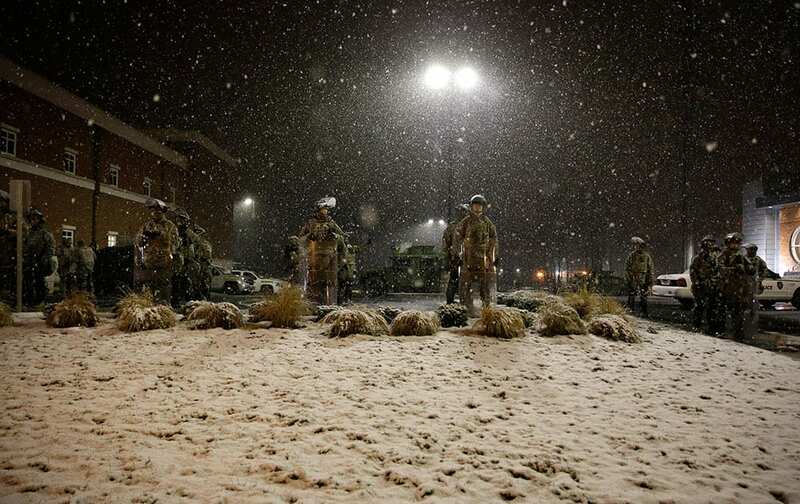 SNOW FALLS AS MISSOURI NATIONAL GUARD STAND OUTSIDE OF THE FERGUSON POLICE DEPARTMENT IN FERGUSON, MO. 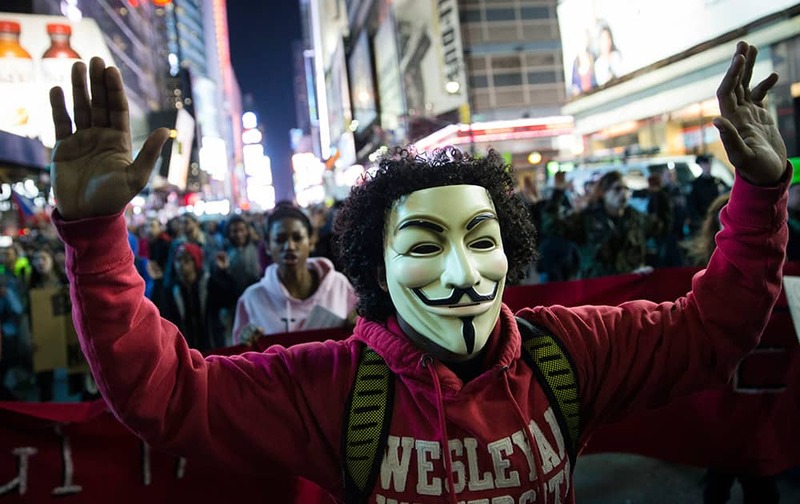 Demonstrators march with their hands raised in protest against a grand jury's decision on Monday not to indict Ferguson police officer Darren Wilson in the shooting of Michael Brown, in New York's Time Square. 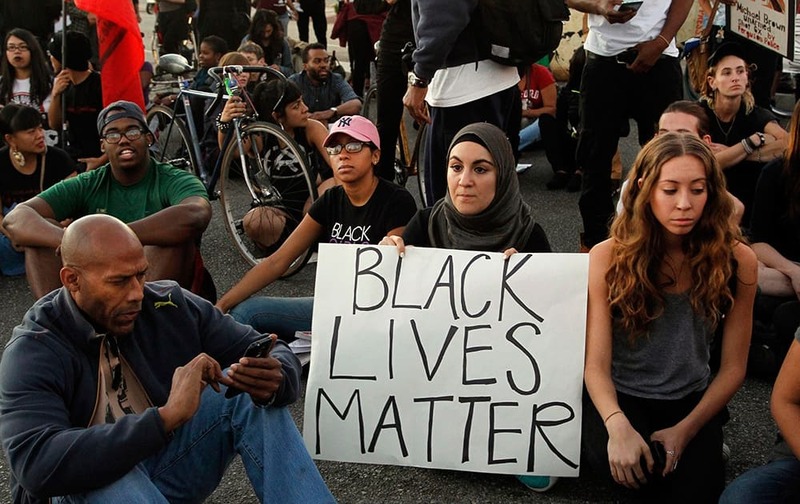 Protesters partake in a sit-in during a rally in Los Angeles, a day after the announcement that a grand jury decided not to indict Ferguson police officer Darren Wilson in the fatal shooting of Michael Brown. 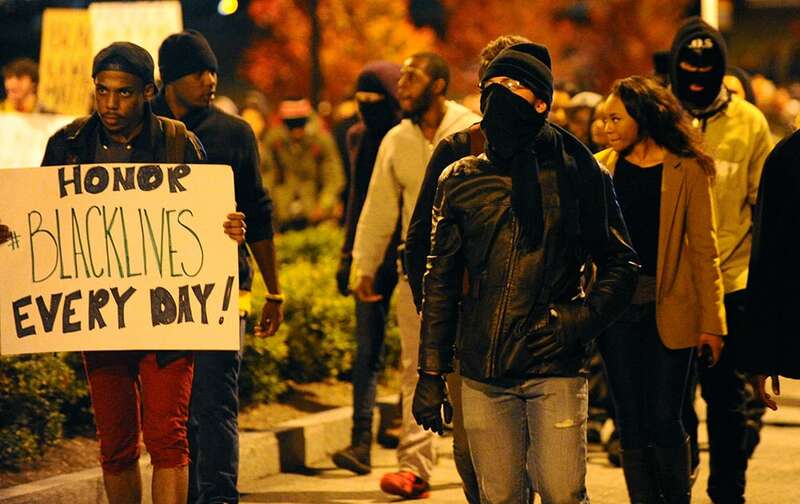 Protesters march through the downtown area before blockading all lanes of Interstate 75/85 northbound near the state capitol building one day after the Ferguson, Missouri, grand jury decision not to indict police officer Darren Wilson in the shooting of Mike Brown, in Atlanta. 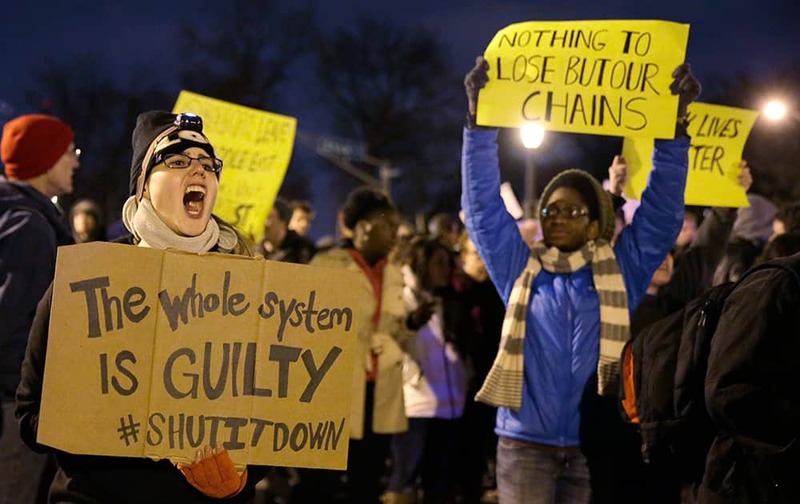 Protesters march through the downtown area before blockading all lanes of Interstate 75/85 northbound near the state capitol building one day after the Ferguson, Missouri, grand jury decision not to indict police officer Darren Wilson in the shooting of Mike Brown. 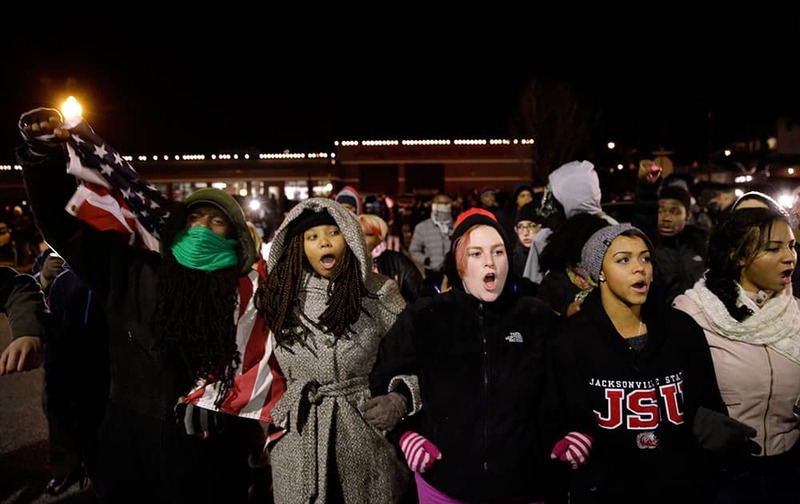 Protesters gather in front of the Ferguson Police Department, in Ferguson. 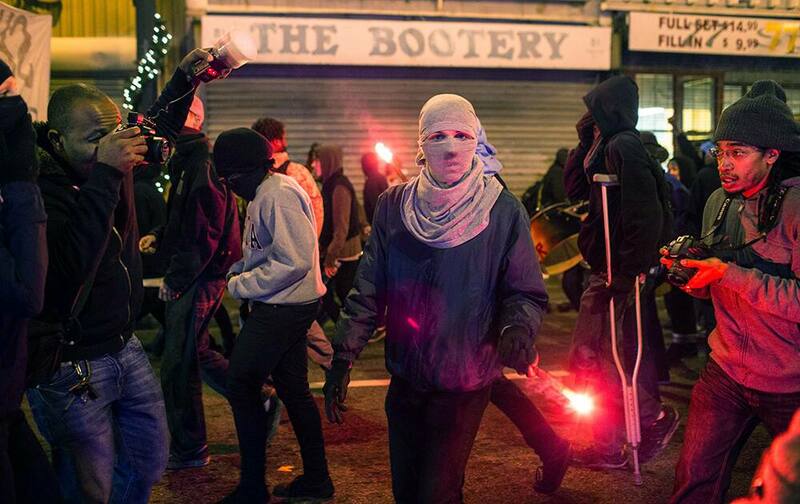 Demonstrators march through the streets during a protest in response to a grand jury decision not to indict police officer Darren Wilson in the killing of Michael Brown, in Atlanta. 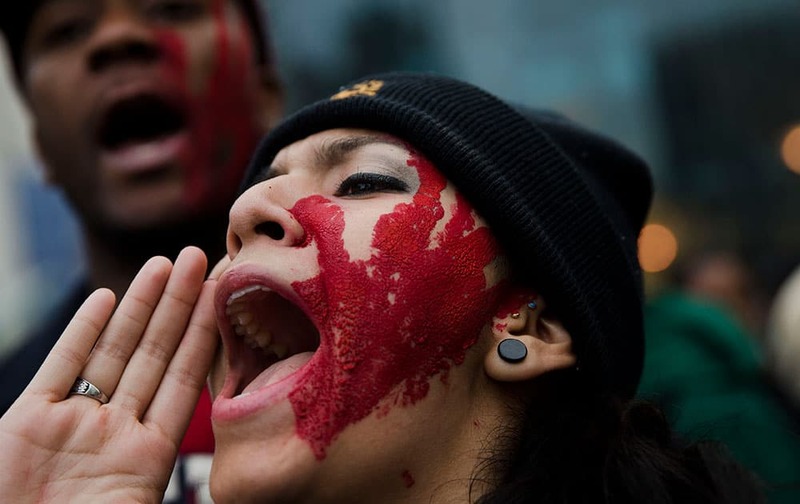 Protesters demonstrate on the day after the announcement that a grand jury decided not to indict Ferguson police officer Darren Wilson in the fatal shooting of Michael Brown, an unarmed 18-year-old, in Philadelphia. 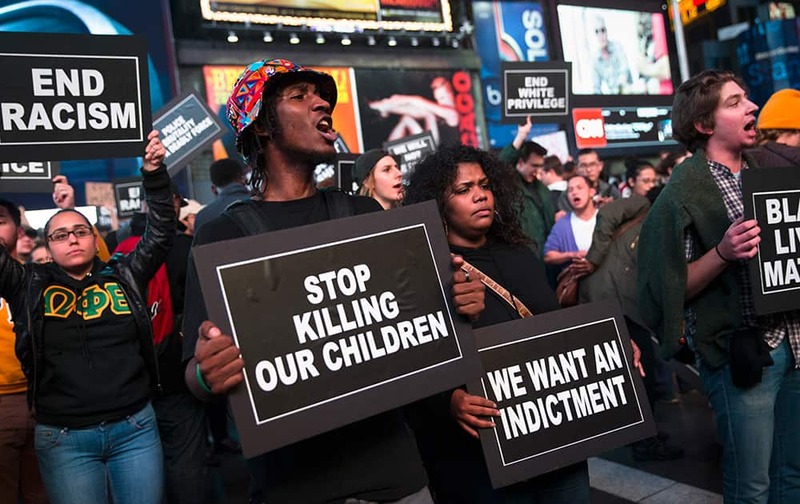 Protestors hold signs during a demonstration in Times Square after the announcement of the grand jury decision not to indict Ferguson police officer Darren Wilson in the fatal shooting of Michael Brown, in New York. 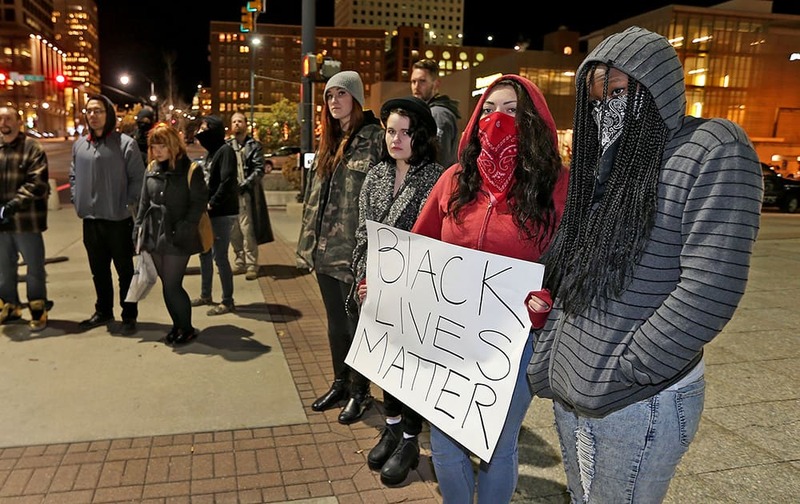 People protest outside the Wallace F Bennett Federal Building on the grand jury has decision not to indict Ferguson police officer Darren Wilson in the death of Michael Brown, in downtown Salt Lake City. 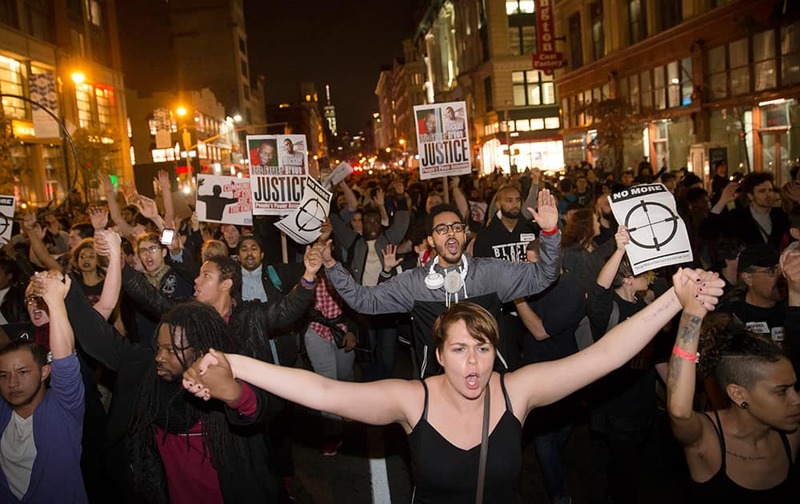 Protestors clasp hands as they march up Seventh Avenue towards Times Square after the announcement of the grand jury decision not to indict police officer Darren Wilson in the fatal shooting of Michael Brown, in New York. 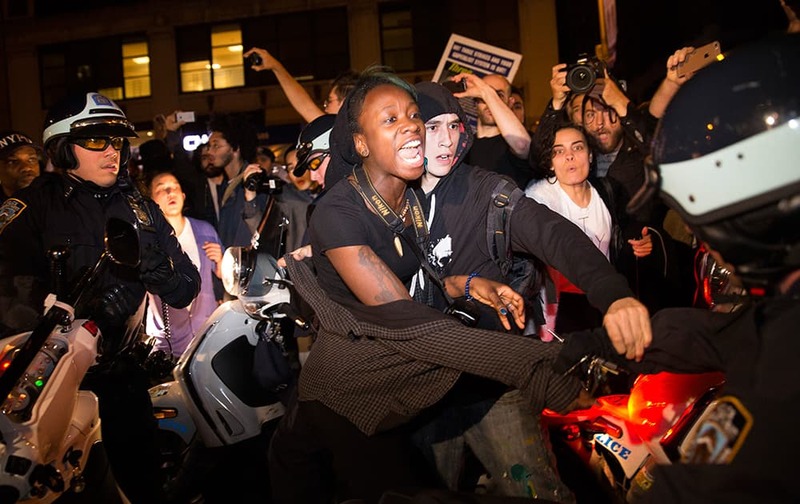 A protestor scuffles with police during a march towards Times Square after the announcement of the grand jury decision not to indict police officer Darren Wilson in the fatal shooting of Michael Brown, in New York. 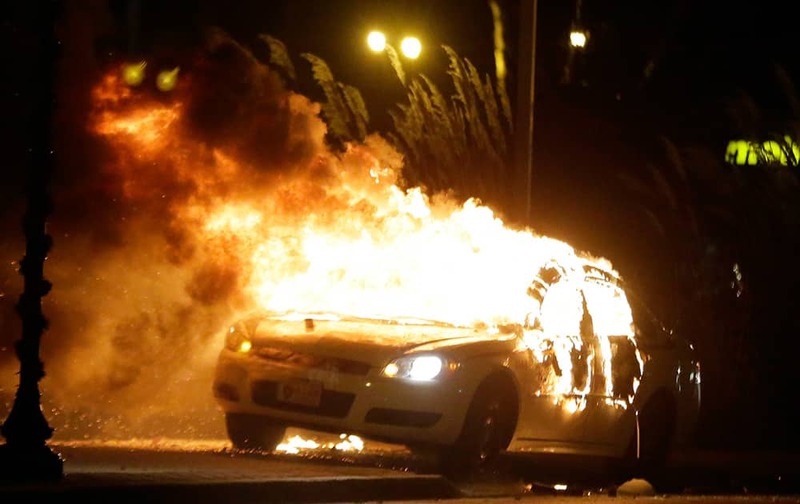 A police car is set on fire after a group of protesters vandalize the vehicle after the announcement of the grand jury decision, in Ferguson. 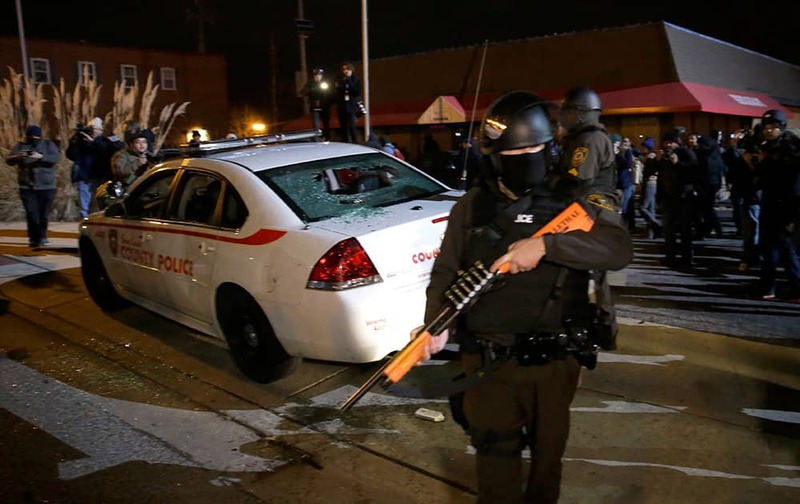 An armed police officer guards the area after a group of protesters vandalize a police cruiser after the announcement of the grand jury decision not to indict police officer Darren Wilson in the fatal shooting of Michael Brown, in Ferguson. 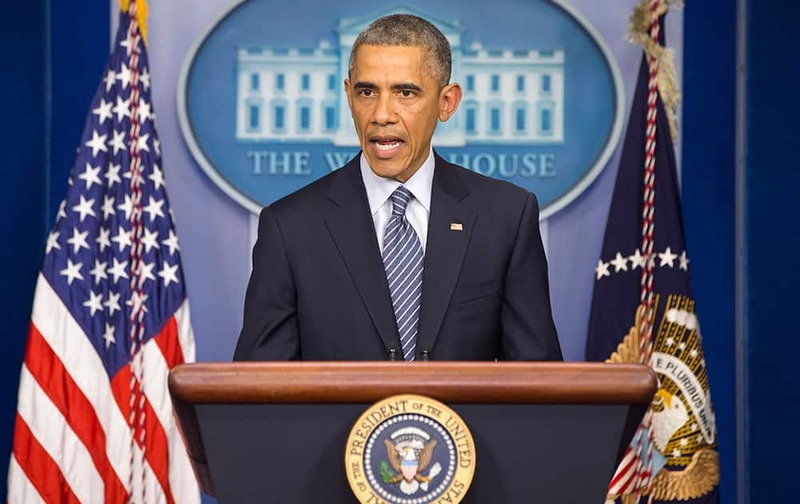 President Barack Obama speaks to the media in the briefing room of the White House, in Washington, after the Ferguson grand jury decided not to indict police officer Darren Wilson in the shooting death of Michael Brown. 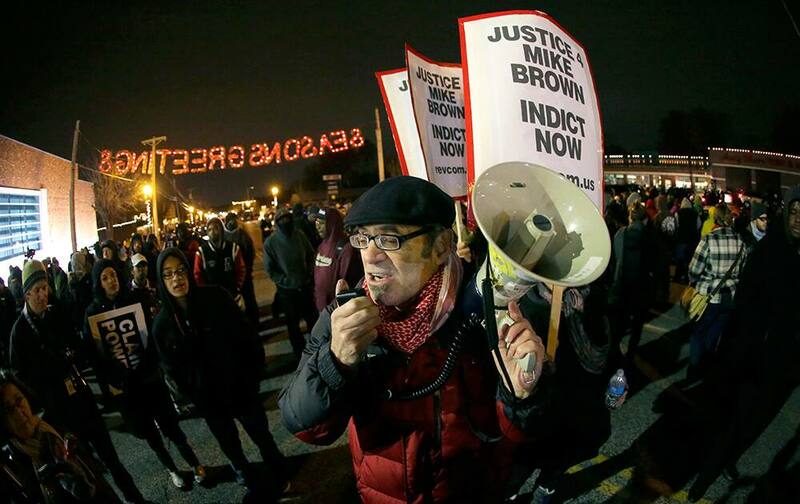 Protesters block streets after the announcement of the grand jury decision, in St. Louis, Mo. 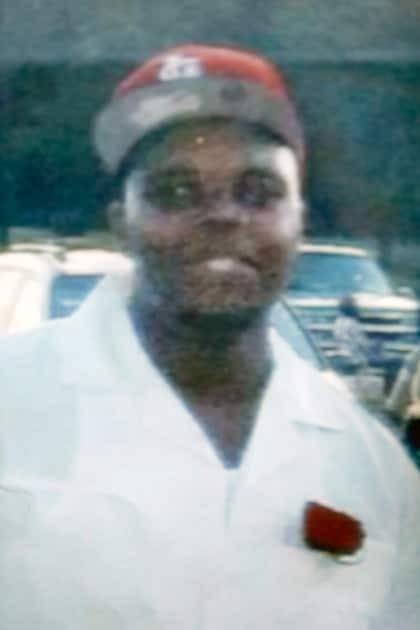 A grand jury has decided not to indict Ferguson police officer Darren Wilson in the shooting death of 18-year-old Michael Brown. 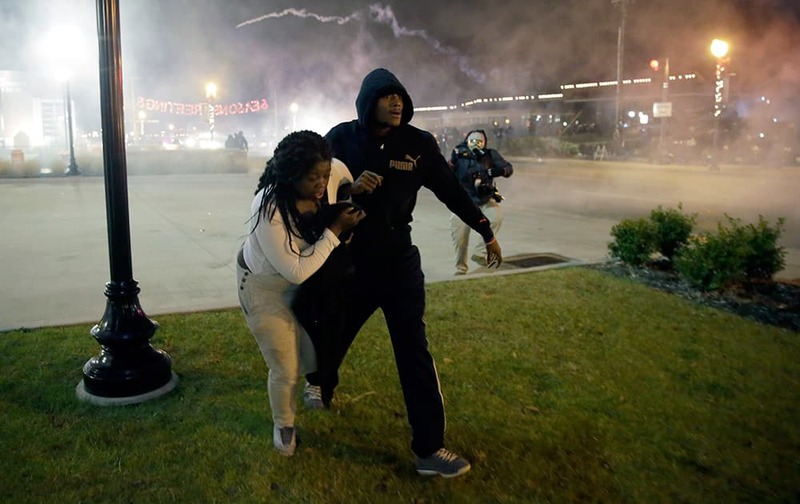 Lesley McSpadden, the mother of Michael Brown, second from left standing on the top of a car, hugs an unidentified man, wearing an I am Mike Brown shirt, as she listens to the announcement of the grand jury decision, in Ferguson. 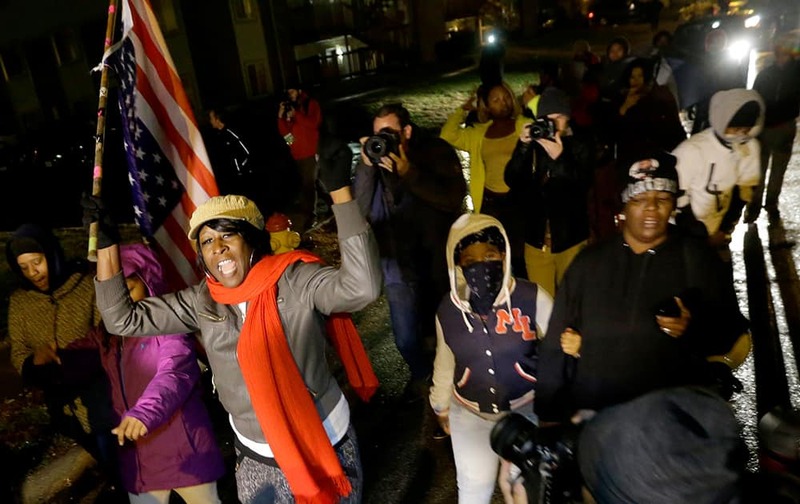 Protesters gather in front of the Ferguson Police Department before the announcement of the grand jury decision about whether to indict a Ferguson police officer in the shooting death of Michael Brown, in Ferguson. 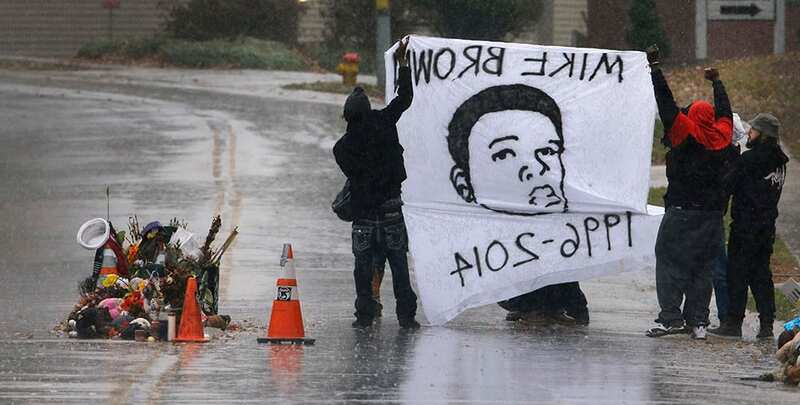 Protesters hold up a banner at a memorial in the middle of a street, more than three months after a black 18-year-old was shot and killed there by a white policeman in Ferguson. 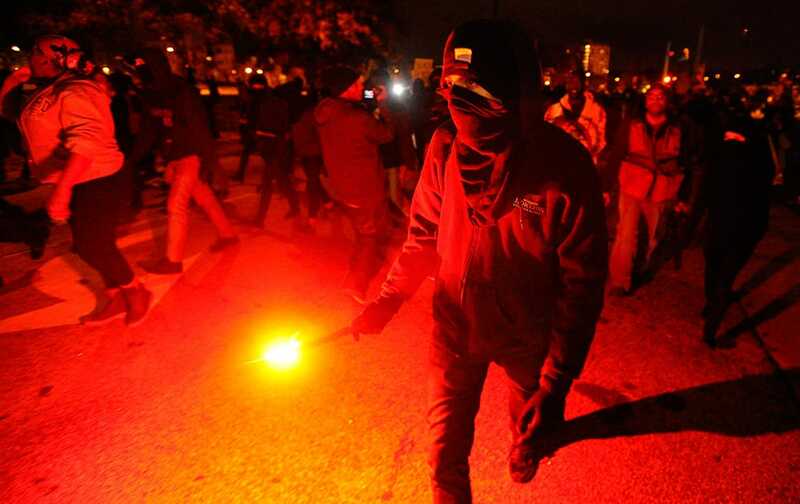 Protesters march, along a stretch of road where violent protests occurred following the August shooting of unarmed black teenager by a white police officer in Ferguson, Mo. 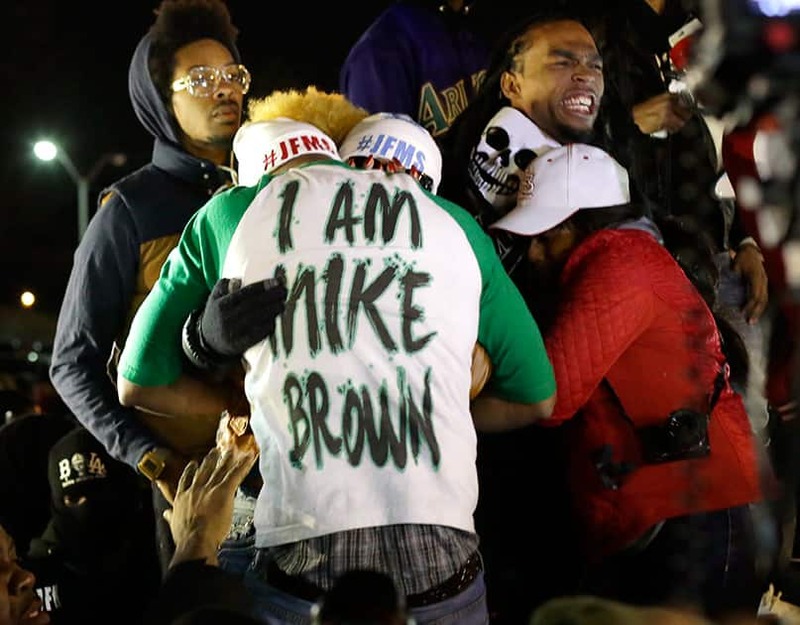 FILE PHOTO - This photo provided by the Brown family is Michael Brown, the black 18-year-old who was fatally shot by a white police officer in August — a death that stirred weeks of violent unrest in Ferguson, Mo.